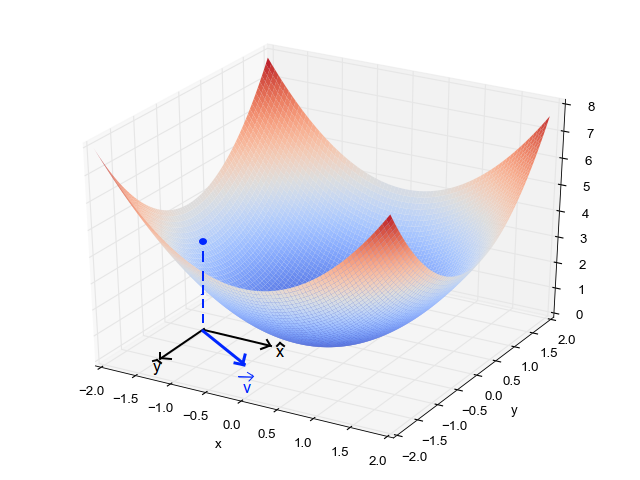 Gradient descent is a standard tool for optimizing complex functions iteratively within a computer program. Its goal is: given some arbitrary function, find a minumum. For some small subset of functions - those that are convex - there's just a single minumum which also happens to be global. For most realistic functions, there may be many minima, so most minima are local. Making sure the optimization finds the "best" minumum and doesn't get stuck in sub-optimial minima is out of the scope of this article. Here we'll just be dealing with the core gradient descent algorithm for finding some minumum from a given starting point. This is also the place for a disclaimer: the examples used throughout the article are trivial, low-dimensional, convex functions. We don't really need an algorithmic procedure to find their global minumum - a quick computation would do, or really just eyeballing the function's plot. In reality we will be dealing with non-linear, 1000-dimensional functions where it's utterly impossible to visualize anything, or solve anything analytically. The approach works just the same there, however. 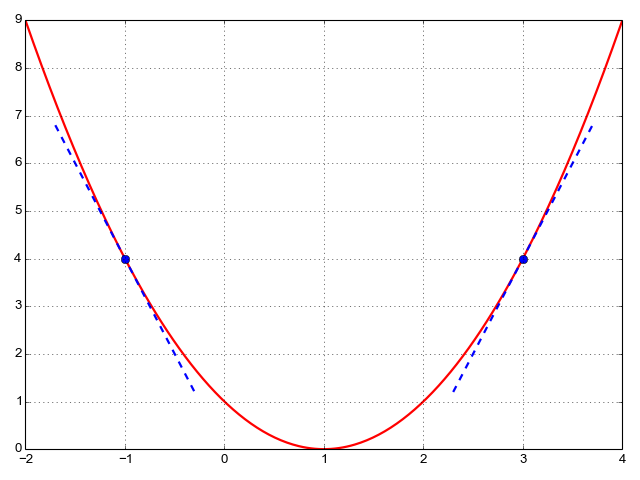 I marked a couple of points on the plot, in blue, and drew the tangents to the function at these points. 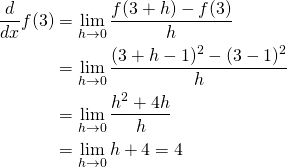 Remember, our goal is to find the minimum of the function. To do that, we'll start with a guess for an x, and continously update it to improve our guess based on some computation. How do we know how to update x? The update has only two possible directions: increase x or decrease x. We have to decide which of the two directions to take. This means that the slope of at is 4; for a very small positive change h to x at that point, the value of will increase by 4h. Therefore, to get closer to the minimum of we should rather decrease a bit. Let's take another example point, . At that point, if we add a little bit to , will decrease by 4x that little bit. So that's exactly what we should do to get closer to the minimum. Where is what we call a "learning rate", and is constant for each given update. It's the reason why we don't care much about the magnitude of the derivative at , only its direction. In general, it makes sense to keep the learning rate fairly small so we only make a tiny step at at time. This makes sense mathematically, because the derivative at a point is defined as the rate of change of assuming an infinitesimal change in x. For some large change x who knows where we will get. It's easy to imagine cases where we'll entirely overshoot the minimum by making too large a step . I also marked the point on where the vectors are based. The goal is to help us keep in mind how the independent variables x and y change, and how that affects . We change x and y by adding some small vector to their current value. The result is "nudging" in the direction of . Remember our goal for this article - find such that this "nudge" gets us closer to a minimum. Previously, for the single-variate case we said that the derivatve points us to the way to the minimum. Now we can say that while there are many ways to get to the minimum (eventually), the gradient points us to the fastest way from any given point. That said, in some advanced variations of gradient descent we actually want to probe different areas of the function early on in the process, so a larger step makes sense (remember, realistic functions have many local minima and we want to find the best one). Further along in the optimization process, when we've settled on a general area of the function we want the learning rate to be small so we actually get to the minimum. This approach is called annealing and I'll leave it for some future article.